Ficopomatus enigmaticus builds and lives in white, calcareous tubes that are about 2 mm in diameter and a couple of centimeters long. The tubes are somewhat flared at their open ends, and have conspicuous, collar-like rings or flanges spaced irregularly along their lengths. Older tubes are typically stained a gold-brown or dark brown along much of their length, with the areas around the flanges and the flared ends usually remaining white. 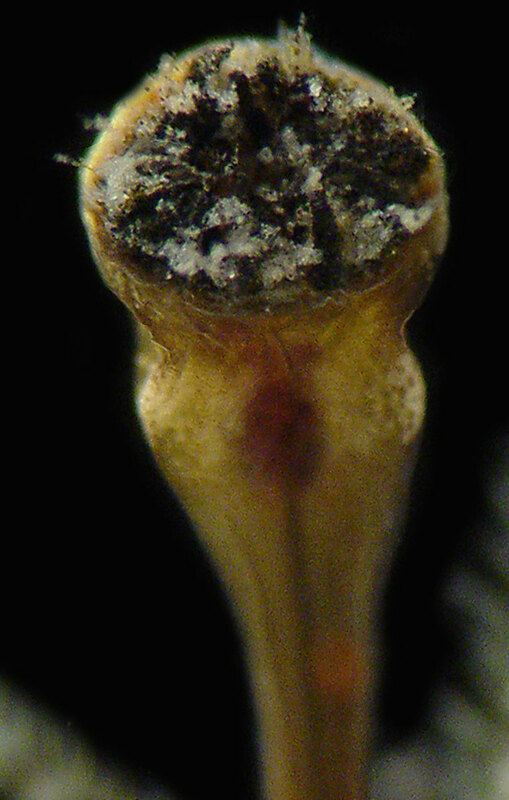 To feed, Ficopomatus enigmaticus extrudes a crown of 12-20 gray, green or brown branching gill plumes out of the open end of the tube. Cilia on the plumes move currents of water upward through them, oxygenating the blood within. Other cilia capture small food particles and pass them down to the mouth at the base of the plumes. 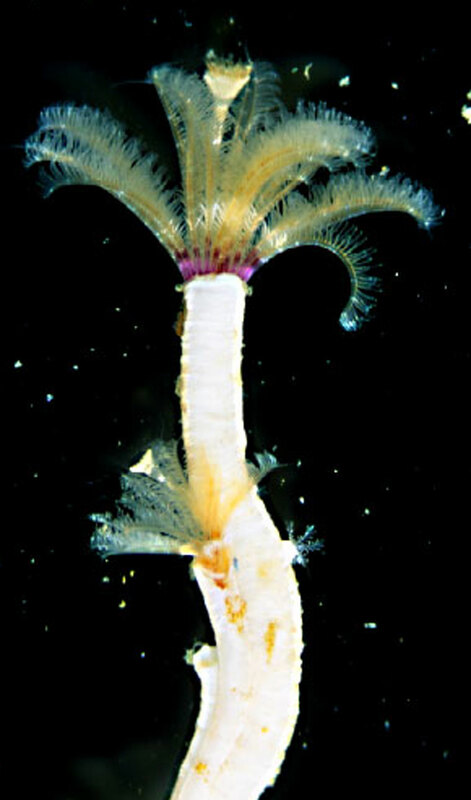 When disturbed, the worm pulls the plumes quickly back into its tube and closes it with a funnel-shaped stopper, called the operculum, at the end of one modified gill plume. The top of the operculum bears numerous, small, black spines. The worm is usually about 2 cm long, including the operculum. 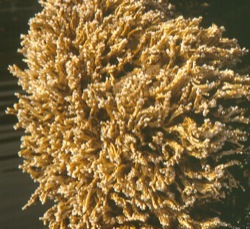 Ficopomatus enigmaticus grows in the low intertidal to shallow subtidal on rocks, concrete, wood, shells and other hard surfaces, including pilings and the sides of floating docks, buoys and boat hulls. It can occur as single, separate tubes, or as tangled, agglomerate masses that form incrustations up to 10 cm or more thick. 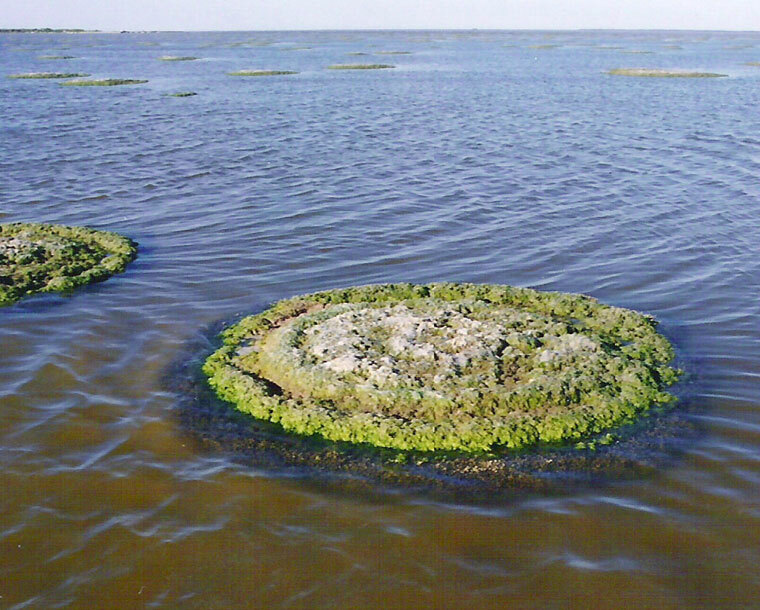 In Argentina's Mar Chiquita Coastal Lagoon, large masses of Ficopomaticus enigmaticus form round reefs up to 7 m in diameter and 0.5 m deep, scattered over hundreds of hectares. 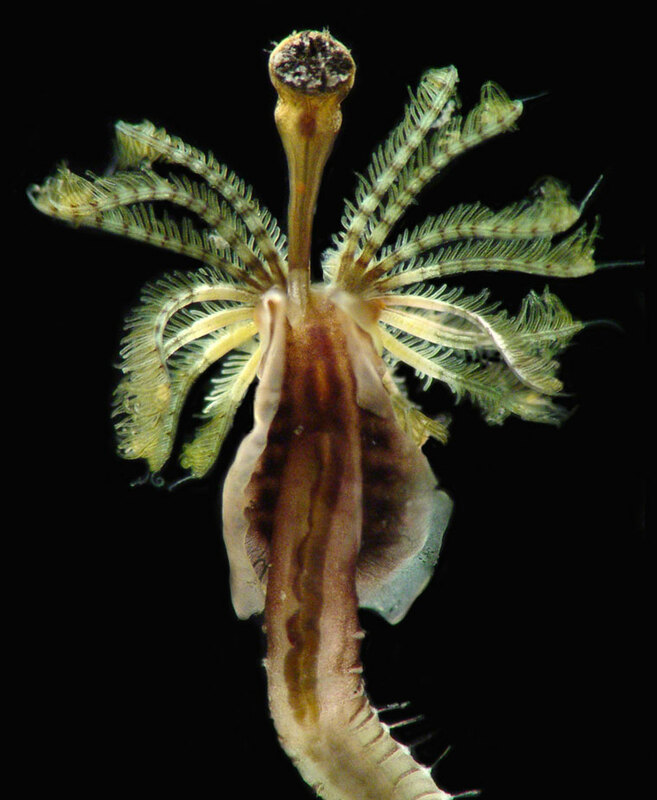 Ficopomatus enigmaticus can survive in ocean salinities, but grows and reproduces only in lower salinities of about 10-30 ppt, and temperatures above 18° C. In several places in Europe it has colonized waters heated by power plant discharges (Vaas 1978). To spawn, eggs and sperm are released into the water where fertilization occurs. 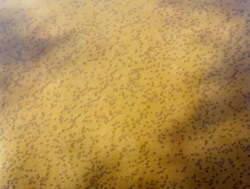 The larvae develop in the plankton, and after 20-25 days settle on and attach to an appropriate hard surface. 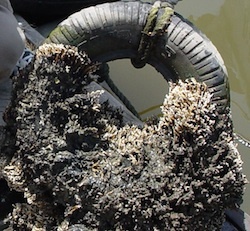 In the Netherlands, masses of Ficopomatus enigmaticus have clogged and interfered with the operation of locks (Vaas 1978), and in New Zealand it has been a nuisance fouler of power plant intake pipes and recreational boat hulls (Forrest et al. 1997). 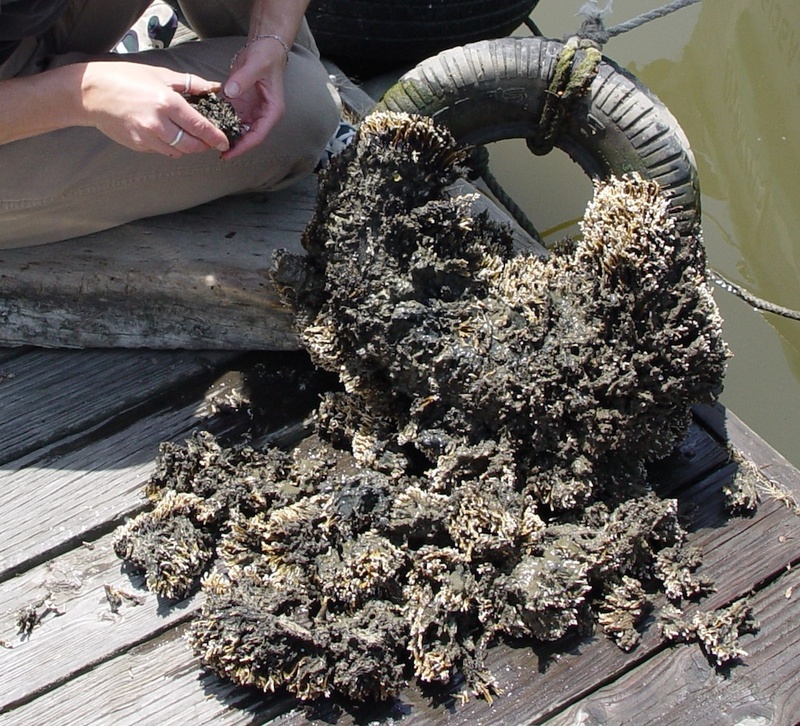 However, it has also been suggested that large populations of Ficopomatus enigmaticus may remove suspended particulate matter, reduce excess nutrient loads and improve oxygen levels in boat basins or enclosed waters with poor water quality (Eno et al. 1997). 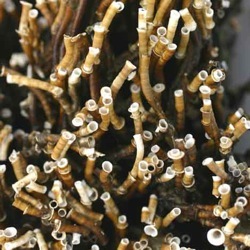 Several other worms on the Pacific Coast build calcareous tubes. Ficopomatus enigmaticus can be distinguished from these by the flanges on its tube and the numerous spines on its funnel-shaped operculum. There are a few other species of Ficopomatus that occur in tropical waters. In these the worm is usually no more than 1 cm long including the operculum. Cool- to warm-temperate regions of the Indian Ocean, possibly including southern or western Australia. In San Francisco Bay, dense aggregations of Ficopomatus enigmaticus coating docks, rocks and concrete walls up to about 20 cm thick (rarely up to 1 m) have been observed in a few brackish lagoons and quiet backwaters, including Lake Merritt [reported in 1921], Aquatic Park Lagoon in Berkeley [observed by 1947], Alameda Lagoon [observed in 1971], Bay Farm Island Lagoon [observed in early 1990s], Foster City Lagoon [collected in 1972], lagoons near Palo Alto [observed in 1974], Belvedere Lagoon [reported in 1979] and the Petaluma River Turning Basin [collected in 1993]. Solitary specimens have been found at many sites around the shores of the bay, ranging upstream to Martinez and to Napa on the Napa River but no closer to the mouth of the bay than Alcatraz Island, reflecting its preference for lower salinities. Four specimens of Ficopomatus enigmaticus (3 living specimens and 1 empty tube) were collected from a small boat marina in Los Angeles Harbor in August and September 2000. It is not yet known if it is established there, and no other records are known from southern California. Ficopomatus enigmaticus has been reported as fouling on ship hulls, and this was probably the mechanism that brought it to San Francisco Bay. Ficopomatus enigmaticus has probably been most often introduced to new regions as fouling on ship and boat hulls, though some of its transport may have occurred as larvae in ballast water, or in some cases as fouling on transported oyster shells. Carlton, J.T. 1979. History, Biogeography, and Ecology of the Introduced Marine and Estuarine Invertebrates of the Pacific Coast of North America. Ph.D. thesis, University of California, Davis, CA (pp. 331-336). Cohen, A.N. and J.T. Carlton. 1995. Nonindigenous Aquatic Species in a United States Estuary: A Case Study of the Biological Invasions of the San Francisco Bay and Delta. U.S. Fish and Wildlife Service, Washington, DC (pp. 42-43). Eno, N.C. R.A. Clark and W.G. Sanderson (eds.). 1997. Non-native marine species in British waters: a review and directory. Joint Nature Conservation Committee, Peterborough, UK (pp. 94-97). Forrest, B., Taylor, M. and C. Hay. 1997. Foreign marine species in New Zealand: towards a risk assessment and management model. Cawthron Institute, Nelson, New Zealand (p. 12). Morris, R.H., D.P. Abbott and E.C. Haderlie. 1980. Intertidal Invertebrates of California. Stanford University Press, Stanford, CA (p. 475). Vaas, K.F. 1978. Immigrants among the animals of the delta-area of the SW. Netherlands. Hydrological Bulletin 9: 114-119. Ficopomatus enigmaticus tubes covering a rock in Aquatic Park Lagoon in Berkeley, on the east shore of San Francisco Bay. Ficopomatus enigmaticus encrusting a tire hanging on the side of a dock at the upper end of the Petaluma River slough, at the northern end of San Francisco Bay. 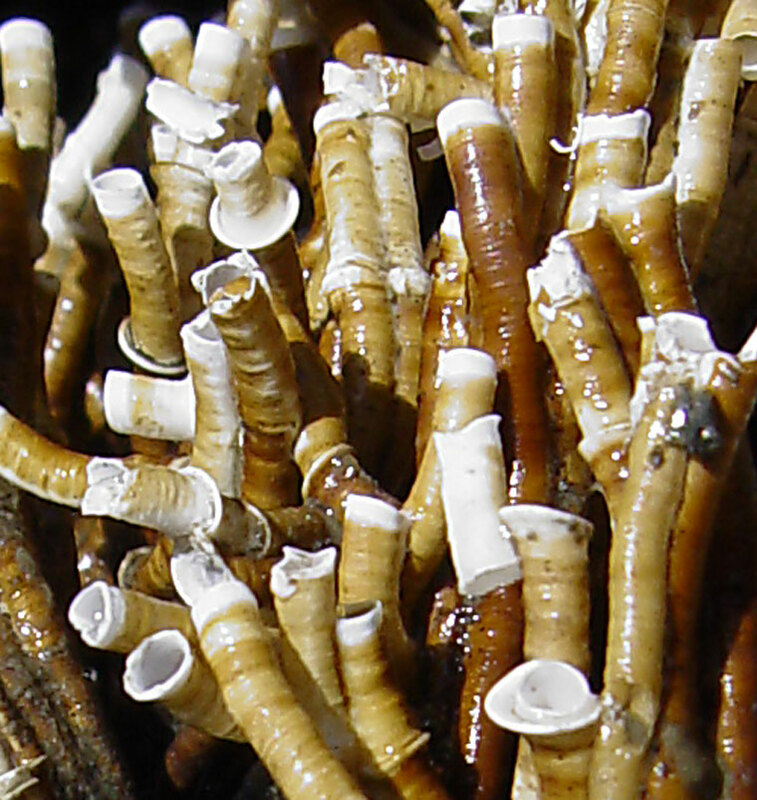 Ficopomatus enigmaticus tubes. Note the pattern of brown staining, and the unstained white areas around flanges and tube ends. 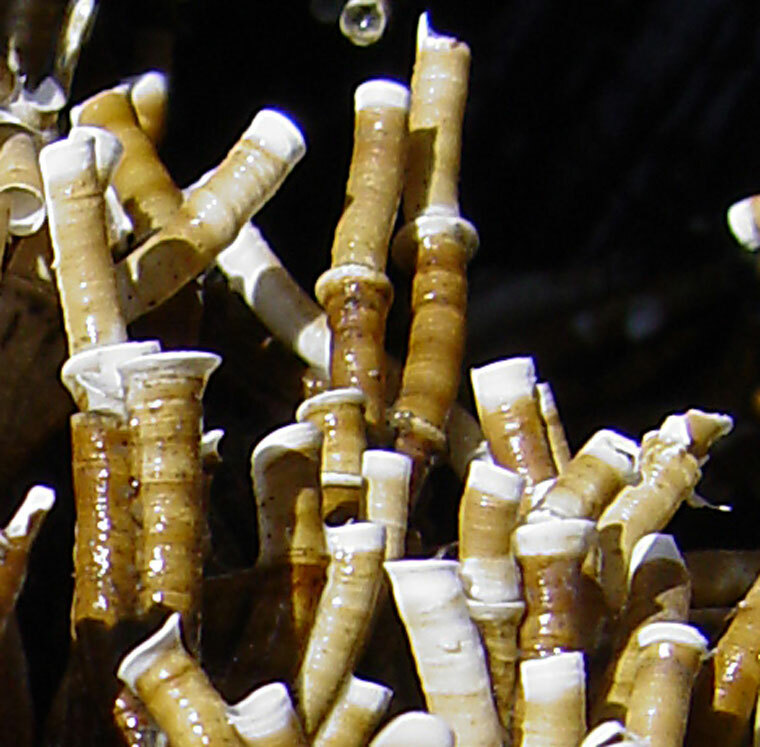 Closeup of Ficopomatus enigmaticus tubes, showing flanges and flaring openings on some tubes. Another closeup of Ficopomatus enigmaticus tubes. Closeup of the head of the same worm, removed from the broken tube. The operculum is at the top of the image. Closeup of the operculum from the previous image. Debris fouling the top surface of the operculum makes the spines difficult to see. 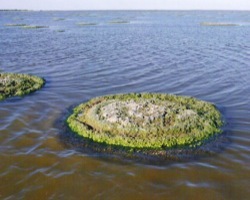 A Ficopomatus enigmaticus reef in the Mar Chiquita Coastal Lagoon, with others in the distance. 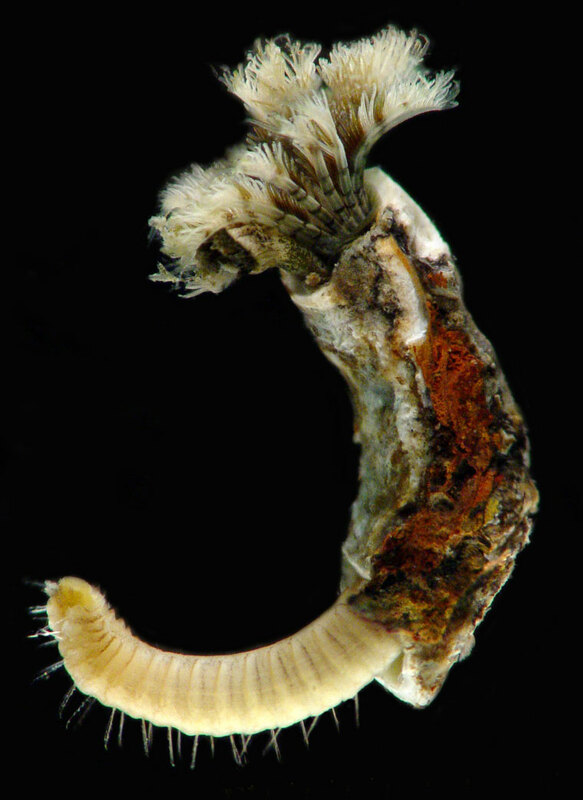 A species of Hydroides, another genus of tube-building worms, that could be confused with Ficopomatus. Note the absence of brown staining or flanges on the tube.